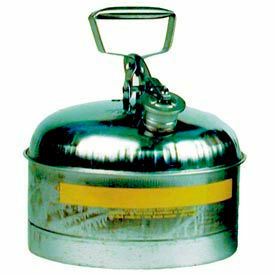 Gas Cans Are Used For A Variety Of Portable Fuel Storage Applications. 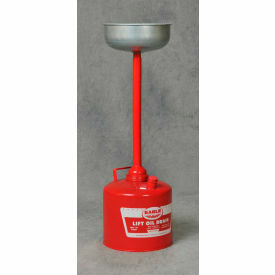 Poly Gas Cans are made of rustproof polyethylene to provide long lasting durability and feature self-venting spout. 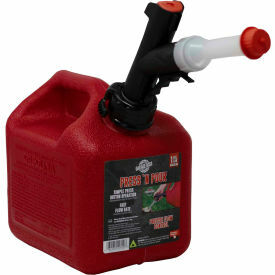 Available in various sizes, gas cans provide a convenient way to fuel your lawn mower, snow blower or leaf blower. Gallon capacities range from 1 to 5.3. 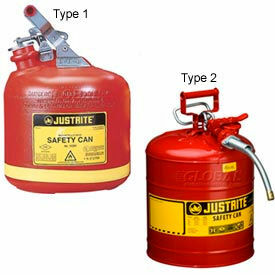 Gas cans are CARB compliant and are available in red, blue and yellow colors. Wavian Jerry Gas Cans Are Made To Highest Specifications For Optimum Performance. 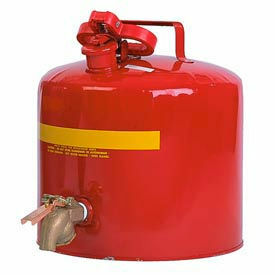 Wavian Jerry Gas Cans are made of steel to provide long lasting durability. System includes spout and spout adapter and a full, internal breather pipe for splash-proof pouring. Fully paint-coated inside and outside. 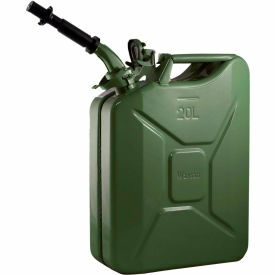 Jerry Cans are manufactured to the highest standards for military, industrial, outdoor, survival, marine, off road and motorsport use. Gallon capacities are 1.32, 2.64 and 5. Available colors are Red, Green, Black, Yellow and Blue. DOT, EPA , C.A.R.B., Australian Standard, Sweden Standard, German Standard and Dangerous Goods approved. Black and Green Cans cannot be shipped to California. Dimensions vary per model. 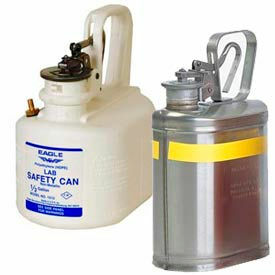 Eagle Safety Cans Allow Safe Handling & Storage Of Gasoline And Other Flammable Liquids. Made using hot dipped 24 gauge galvanized steel with lead-free technology and powder coat finish. Comfort grip release trigger for ease of use. Spring closing lid with Neoprene gasket vents offer 5 psi internal pressure. Includes non-sparking flame arrestor and pour spout. Includes tri-lingual warning label for safety. Type II Cans feature 2 openings; one with a pressure-relief spring closing lid for filling and one with an actuated pour valve and flexible metal spout for safer controlled dispensing. Filler spout and flame arrestors offer flashback protection. Meets OSHA and NFPA code 30 requirements. FM approved. Eagle Poly Safety Cans Are Impervious To Many Liquid Chemicals, Acids, Caustics, Solvents And Corrosives To Help Reduce The Danger Of Explosions. Made using high density polyethylene for dent and puncture resistance. Corrosion resistant stainless steel fittings and flame arrestors for safety. Includes brass grounding connectors. Meets OSHA requirements and NFPA code 30. FM approved. 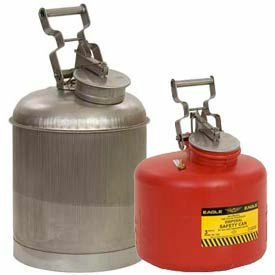 Eagle Laboratory Safety Cans Reduce The Danger Of Explosions Resulting From The Ignition Of Vapors Of Flammable Liquids. Deep drawn seamless steel for strength. Non-sparking flame arrestor and pour spout for safety. Includes a spring closing lid with Neoprene gasket vents. Choose between Powder Coated Galvanized Steel, Stainless Steel or High Density Polyethylene for safe storage and handling of most chemical compounds. FM approved. Waste Disposal Cans Are Used For Providing An Intermediate Station For Temporary Storage Of Liquid Chemical Wastes. Eagle Stainless Steel Safety Cans Are Impervious To Many Liquid Chemicals, Acids, Caustics, Solvents And Corrosives To Help Reduce The Danger Of Explosions. Made using 24 gauge type 316 stainless steel. Used for when high solvent purity is essential. Corrosion resistant stainless steel fittings and flame arrestors for safety. Includes brass grounding connectors. Meets OSHA requirements and NFPA code 30. FM approved. Eagle Faucet Safety Cans Help Control Dispensing Of Flammable Liquids Into Small Capacity Vessels Using A Drip-Free Faucet. Deep drawn seamless steel for strength. Non-sparking flame arrestor and pour spout for safety. Includes a spring closing lid with Neoprene gasket vents. 5 gallon capacity. Choose between Galvanized or Stainless Steel. Meets OSHA requirements and NFPA code 30. FM approved. 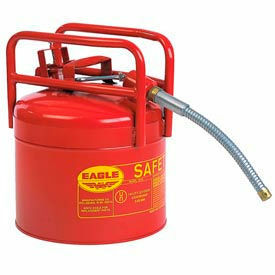 These Eagle Transport Safety Cans Help Reduce The Danger Of Explosions While Dispensing Flammable Liquids Through A Flexible Metal Spout. 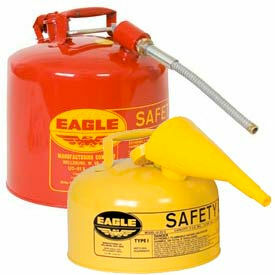 This Eagle type II safety can is made using double-walled brass flame arrestors in a filler opening and a pour spout. Heavy duty roll bars protect spouts and thumb screw mechanism to assure the filler opening stays closed when transported. 5 gallon capacity. Meets OSHA requirements and NFPA code 30. Complies with UN/DOT standards. 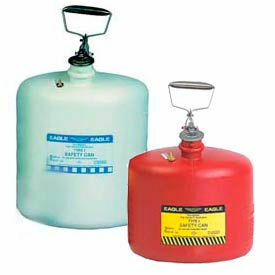 FLO-FAST™ Poly Gas Cans Are Used For Storing Or Transporting Various Hazardous Liquids. 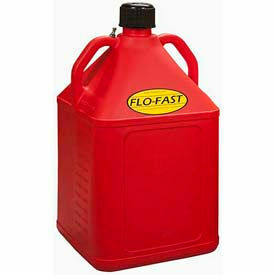 FLO-FAST™ Poly Gas Cans are made using rotationally-molded high-density polyethylene for lasting durability. Containers are double-handled for easy lifting and transport. Metal vent allows smooth pouring. Available in a variety of sizes and colors. Dispensing cans permit easy, one-hand dispensing of liquids directly onto work surface. Dependable performance for foundries, machine shops, factories and steel mills.